I'm doing some genealogy research for my family and stumbled upon new material that involves the US 13th Cavalry Band. This unit saw time in the Philippines from 1902 until 1911. Wondering if you guys would like to help me clear up some lingering questions. Do you have ideas on how a Filipino native could have managed to integrate himself in a US Army unit outside of the "Buffalo Soldier" regiments and the Philippine Scouts? It was my impression that the US Army during this era was very segregated. 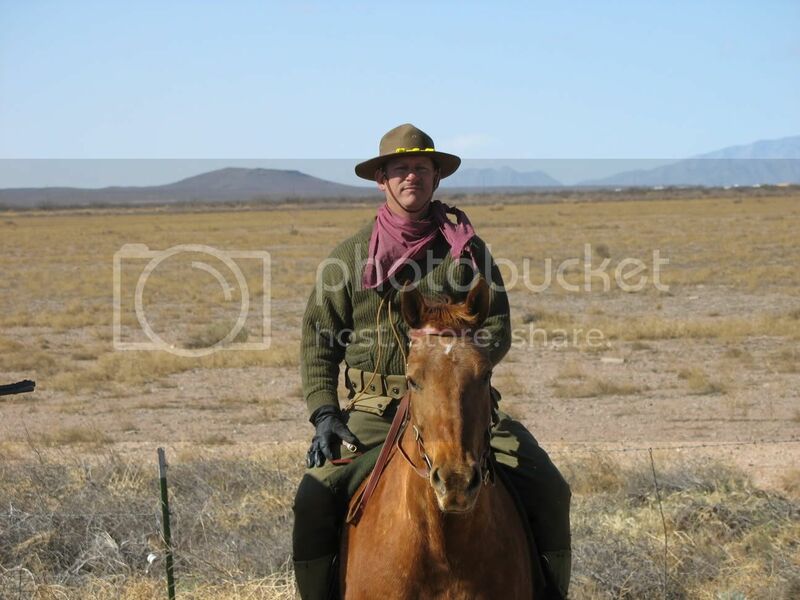 A great-great-grand uncle of mine (Simon Negrito) was pictured with the US 13th Cavalry in 1915 at Columbus, New Mexico. He held the rank of a sergeant. Based on this photo it would seem that Sgt. Negrito was at Columbus when Pacho Villa raided the area and may have accompanied Gen. Pershing and a young George Patton in the pursuit of the notorius bandit. Appreciate your input. Maraming salamat! PS: For you guys following the thread: "Battle of Paye or San Mateo", Simon Negrito is a brother-in-law of Gen. Licerio Geronimo. Their spouses were siblings. Simon is shown in the top row (second from the left) of the attached photo. I managed to locate a Simon Negrito who enlisted in the 9th Cavalry (can't make out the specific company due to poor handwriting) at Ft. Walla Walla, Washington on May 7, 1904 and discharged at Ft. Riley, Kansas on April 28, 1907. The birth year is given as sometime in 1883. From the US Census records for 1920, I also located a Simon Negrito in 1920 living in Camp Grant New Mexico with a listed occupation as "Ex-Soldier". The birthdate is given as 1884 (no precise date). I believe this is the same man due to a margin note indicating that he enlisted in the Army in 1907. The record also indicates that he immigrated to the US in 1901. There's nothing on the 13th Cavalry but that's not to say it doesn't exist. Mr. Negrito came to the US in 1901 and subsequently enlisted in the US Army in 1907. Having him enlist in the 9th Cavalry is pretty logical. The interesting thing is how he made it over to the 13th Cavalry. Just a theory, this assumes that these records are for your family member. Thank you very much for responding to my inquiry. The birth year of between 1882 and 1884 matches my family’s estimate. Simon passed away in early 1972 and at the time we believed his age was around 90. Yes, I did ran into that enumeration (1920 census) that listed Simon, his wife, and niece as residents of Central (now Santa Clara), Grant County – about 75 miles north of Columbus. Based on these (photo and census), I’m assuming that after the punitive expeditions, Simon retired from the service and tried his luck in the mining industry. Noticed though that the 1901 US arrival date for Simon was crossed out - I wonder why? Simon eventually left the US and returned to the Philippines sometime in 1930. My theory is that the Great Depression had hit New Mexico hard. Anyway, Simon settled in his wife’s hometown of San Mateo where he became a much-loved person. He was heavily involved in the community and was even responsible for founding a marching band for kids – a band that he alone financed and instructed. Many less-privileged kids of the town benefited from the musical instruction imparted by this man; lessons that these kids were able to translate into college education via musical scholarships. Family members recall Simon had received monthly pensions mailed from the US. Older family members often talked about how this man was “Band member in the US Cavalry”. Specifics were either never mentioned or lost through the passage of time. After stumbling upon that photo of the 13th Cavalry Band and locating him in the 1920 US Census, I have now confirmation that this man had indeed served in the US Cavalry. How he began his military career is still a mystery. The 9th Cavalry record is truly a great find and a big step in the right direction. Simon was a native of Nabua, Camarines Sur province – a place in close proximity to Albay where the 9th Cavalry had spent considerable time in the early 1900s. How Simon ended up with the 13th is still unanswered. Even more of a mystery now is how he ended up in Walla Walla before his enlistment. Was he able to latch on with the 9th – while still in the Philippines -before finally being able to formally enlist with them in 1904? Some questions answered but even more questions crop up. Ah, the joy of historical/genealogical research. There is much literature out there about Filipinos being part of many significant events in US history: from Filipinos that settled in the Bayous of Louisiana, to a Filipino that may have been one of the founders of Los Angeles, and to a Filipino, or two, who had joined the Union Army during the Civil War. Now add another one: Shootout with Pancho Villa. Mabuhay! Richard, you may have noticed I did some research on Macabebe Scout history. This may be of some use to you...on June 1, 1900, Maj Matthew Batson was authorized to start a cavalry consisting of native scouts...this group would be named "The Squadron of Philippine Cavalry" and Maj Batson was assigned squadron commander. I vaguely remember reading Batsons report on his formation of this Philippine Cavalry...this was a year or so ago when I read some report, but I can not find it now. You might want to look down that avenue. Good luck and keep us informed! I need information on how the early 1900s cavalry regiments were structured. Are these divided into squadrons with each squadron divided into troops (e.g. A, B, C, D, etc.)? How about the unit tagged "Headquarters". Is this a separate unit? Is the regiment band under the group "Headquarters"? Still tracking the movement of Lolo Simon through the ranks of the US Cavalry. Adam, thank you for the lead that you've provided. I've found some new info and will post them here shortly after I've filled in the "holes". Yes Macky, Lolo Simon was a great musician. Old family members have many anecdotes concerning him. Unfortunately, the details are mostly lacking. In one anecdote, it is mentioned how he wowed the townspeople of a US town with his performance which ended in the townspeople parading Simon around town on their shoulders. Kevin, I'll follow the lead you provided. Hope something new turns up. Thanks guys! Hello Taga-Ilog....................................I have a picture here taken early 1900 at Camp McGrath, Batangas Town of the 13th Infantry Band not Cavalry it look like they have 2 Filipino Natives in it. Anyone of them can be your Lolo Simon? Good looking pinoys but neither looks like my lolo. Thanks for sharing though. I wonder how these two got in? I bet another fascinating story behind their enlistment. I believe Sumaquel (Macky) has a research that early as American Revolution, there are already a Filipino who fought against the British. Maybe you can share your research - I don't know the details. With your help, I have been able to piece together Lolo Simon's military career with the US Cavalry. Thank you. The military career of Simon spanned twelve years which included two stints each with the famed 9th Cavalry Regiment (Buffalo Soldiers) and the 13th Cavalry Regiment. It began on May 7th, 1901 when a then underage Simon enlisted at the 9th Cavalry’s headquarters at Nueva Caceres (present-day Naga). Most likely recruited for his musical background, this Nabua native was assigned to the regiment’s band unit. His two three-year enlistments with the Ninth took him around the Camarines area, to Fort Walla Walla, Washington (via the Presidio at SF), and finally to Fort Riley, Kansas. Both of these enlistments ended with excellent reviews, honorable discharges and promotions – first as a corporal, and finally a sergeant. His second stint with the Ninth ended a week before this regiment was sent back to the Philippines (just a theory: it seems that Simon did not want to return to the Philippines and was let out early from this commitment and did not reenlist). Simon then took a job as a band member in the National Home for Disabled Volunteer Soldiers at Delaware Township, Leavenworth, Kansas. Simon and the band at this institution provided music for the daily raising and lowering of flags; and also concerts throughout the year to entertain and “boost the morale” of these disabled and aging soldiers (mostly Civil War vets) who were under this institution’s care. Four years after leaving the army Simon reenlisted again; this time with the newly arrived (from the P.I.) 13th Cavalry Regiment at Fort Riley. Once again he was assigned to the band and was its baritone player. Soon after, the 13th was transferred to Fort Bliss, El Paso Texas. It was during Simon’s second stint with the 13th when tensions rose between the US and the Mexican government due to the actions of the presidents of both countries and also of one José Doroteo Arango Arámbula, better known as Francisco Villa (Pancho Villa). A detachment from the 13th Cavalry (including the band) stationed at Fort Bliss was transferred 70 miles west to Camp Furlong at Columbus, New Mexico. Life for the band at camp involved parading around town, mounted, playing waltzes, two-steps, marches, etc. ; and guard duty whenever the rest of the troops were out on patrol. Such was the case in the pre-dawn hours on March 9th, 1916, when only Troop F and the band were at camp when an estimated 500 Villistas raided Columbus. After a fierce battle, the Villistas retreated leaving 80 of their men dead. 18 Americans were killed including two from the band. After this event, the army and national guardsmen from all the states in the Union would then be mobilized to the area and the punitive expeditions led by Gen. John “Blackjack” Pershing and his aide Lt. George Patton soon followed. Simon and the band joined these expeditions that went at least 500 miles deep into Mexico. The US Army ultimately failed to capture Pancho Villa. On January 26th, 1917, the 13th Cavalry and its band began the trip back to Texas. Four months later, Simon was given, for a fourth time, an excellent review and an honorable discharge. It would seem that Simon soon found employment again as a musician with the “Post band” at nearby Fort Bayard. Fort Bayard was a former military installation that was converted into a sanatorium (tuberculosis hospital), and a medical research center. It can be assumed that Simon performed here a similar job that he did back at the Soldiers Home in Kansas. It is unknown how long he worked at this hospital but by March of 1920, Simon, his wife Victoria (Victorina “Ina” Limcauco), and niece “Nena” had already moved out of the fort and moved two miles south to the village of Central (present-day Sta. Clara), NM. It is believed that by 1930, Simon returned to the Philippines - thus giving my family the opportunity to know this great man. Looking forward to seeing more about your relative when you find it. Are you in the SeaTac area? Glad to know that you've enjoyed my write-up on Lolo Simon. I'll definitely keep you guys posted on anything more that I can dig up. P.S. I'm attaching another cavalry photo. I believe it was taken sometime in 1917 at El Paso. Simon is on the far right. "Do you have ideas on how a Filipino native could have managed to integrate himself in a US Army unit outside of the "Buffalo Soldier" regiments and the Philippine Scouts? It was my impression that the US Army during this era was very segregated." "I wish you could hear our band. It is the best I have ever seen in the service...back at Camp Meade it was the worst collection of noise makers in existence. ....Then a number of Philippine musicians were enlisted, eleven I think, all of them experts, and it is simply marvelous the change brought about in a short time. Some of the other colonels asked permission to enlist Philippinos (sic.) but Gen. Otis promptly refused them. We however read the law and concluded there was no objection to their enlistment and so sworn them into service knowing the law was clear and explanations would be easy and in the meantime we could hear some good music." From this it would seem that US regiments throughout the Philippines began enlisting Filipinos into their bands as early as 1900. I found another photo of Sgt. Simon Negrito ( y Herasga). This group portrait of the Ninth US Cavalry band appeared on the May 27, 1904 issue of the Seattle Republican. I'm guessing that the photo was taken at Fort Walla Walla, Washington where this band was stationed at the time. One thing that immediately catches one's attention is the number of Pilipino members. I count eight - one-third of the band! Hope we can also learn more about these other Pinoys. Enjoy! I apologize for this late reply. I've just read your post this morning. May I know the name of your grandfather (brother to Lolo Simon Negrito)? If you prefer, you may search for me on Facebook under the name Historic San Mateo. Looking forward to hearing from you.